Earlier this month, the NBA formally approved a change to its shot clock rules. Now, following an offensive rebound, the shot clock will reset to just 14 seconds, instead of the usual 24. Over at Nylon Calculus, Daniel Massop argues that the effect on pace will be minimal, given that only 6 percent of offensive rebound possessions lasted more than 14 seconds. For a deeper dive, check out Blake Murphy's piece at Uproxx, which uses, among other data points, stats from the NBA's G-League, which went to the 14 second rule two seasons back. As it turns out, the WNBA was also an early adopter of this rule change, having switched to 14 seconds for the 2016 season. That rule's impact on pace can provide clues to what will happen in the NBA this season. 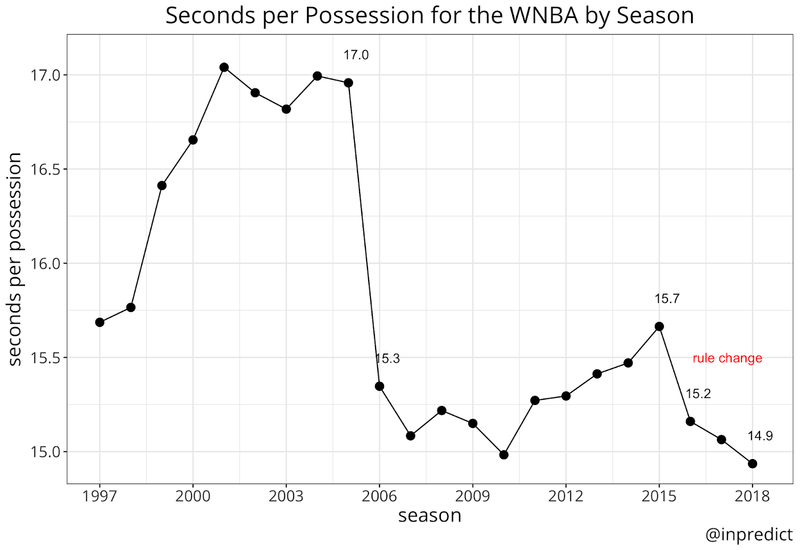 The chart below shows average seconds per possession in the WNBA for every season. After the WNBA enacted its rule change, average seconds per possession dropped from 15.7 to 15.2, which is significant. That is an extra 5 possessions per 40 minutes. However, the quickening pace may be part of a overall trend and not necessarily related to the offensive rebound rule change. 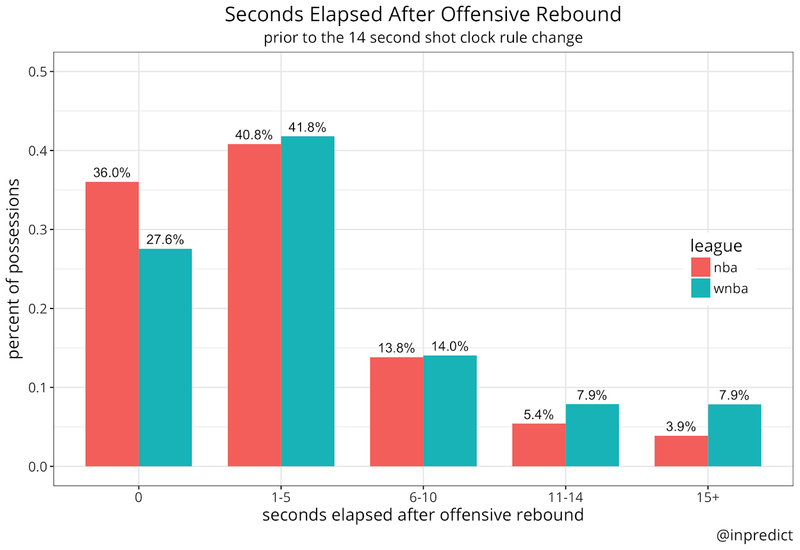 To tease out the impact of the rule change, we can track pace separately for possessions in which an offensive rebound occurs. Pace quickened for both types of possessions, but the biggest impact was clearly on possessions with offensive rebounds, where seconds per possession dropped by 8 percent. 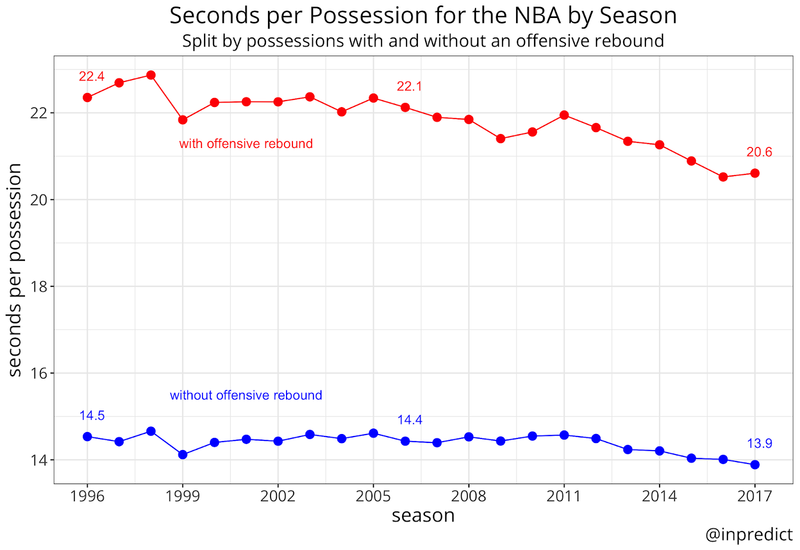 The NBA has a much higher percentage of 0 second possessions (i.e. "put backs") and a lower percentage of possessions that last longer than 10 seconds. It's the latter type that will be most affected by the rule change. Using this data, we can put together a rough estimate of how the 14 second shot clock will affect possession length (and possession count) in the NBA. 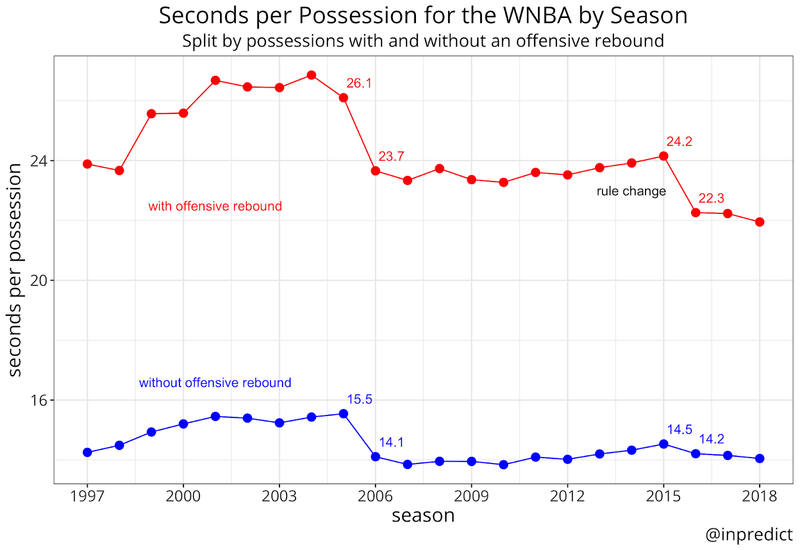 The WNBA rule change led to a 8% decrease in the length of offensive rebound possessions. We would expect that decrease to be smaller for the NBA since fewer possessions are in the affected zone of 11-14 seconds and 15+ seconds. I don't have a precise way to estimate this, but a 5% decline in possession length seems like a reasonable estimate. In the 2017-18 NBA season, offensive rebound possessions made up 11.6% of total possessions and averaged 20.6 seconds. Non-offensive rebound possessions averaged 13.9 seconds, and in total average possession length was 14.67 seconds. A drop in average possession length of 0.12 doesn't sound like much, but over the course of 48 minutes, that works out to an extra 1.5 possessions per game. If you're betting the point totals, that means you probably want to adjust your numbers up by about 1.5 points as a result of the rule change. Of course, there are broader trends to consider. The NBA has been on a longer term trend towards quicker pace, and that could continue into this season, meaning we may see more than a 1.5 increase in possessions per game. But as the season progresses, I can check back on pace for just offensive rebound possessions to see if the 5% drop was an accurate prediction.